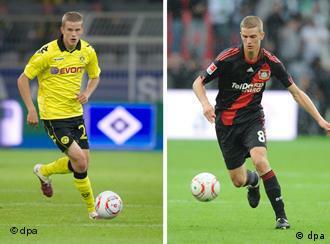 Lars and Sven Bender are certainly the most talented twins in the world of football. Year upon year at least one of them is linked with a move to Arsenal, this summer proving no different. So who are these two brothers and why do so many regard them as a perfect fit for the Gunners midfield? This week the media speculated Arsene Wenger had made contact with Dortmund's Sven Bender. Last summer the rumours revolved around Leverkuson's Lars Bender. The twins are not just identical in sight but also in footballing ability. Both playing as strong, defensively-minded midfielders with passing ability imposing enough to dictate the game. As they improve in the coming years, it's hard to see what will stop them becoming complete footballers. Born in Rosenheim, Germany, the brothers first excelled at the youth academy of 1860 Munich. By 2006 they had become first team regulars with Lars becoming club captain at the age of 21. It wasn't long before the big clubs of the Bundesliga began to take notice of their potential. In 2009 Lars made the transfer to Leverkuson whilst Sven moved to Borussia Dortmund. The twins progressed over the years, building reputations as combative, reliable midfielders. Whilst Sven has collected more silverware, is it Lars, who is thought to be the more technically gifted. Although some would argue he has had more opportunity to show this as the Leverkuson team has been built around him. Sven has to be more disciplined in his work to allow Dortmund's attacking players to flourish. The twins International career is still waiting to take off, both with only a handful of caps. This is more to do with the players who have come before them in Bastian Schweinsteiger, Sami Khedira and Phillip Lahm. Those players have now aged and the Bender twins along with Christoph Kramer are expected to fill the void. Injuries have also been a problem for the brothers with Sven missing a chunk of last season through niggling injuries, this appears to come as a consequence of his robust style. So would the identical Germans work well at Arsenal? the answer is a simple, yes. With Wenger searching for a playmate to rotate with Coquelin, the twins would be more then adequate in this department, matching the Frenchman for tackles and interceptions. They would improve on this with their ability to win Aeriel duals and passing prowess. The twins style bares an uncanny resemblance to the leggy, former Liverpool player, Didi Hamann. The success of twins in football is rare, exceptions can be given to the De Boers. Rafael and Fabio have had their moments. England offered up Dean and David Holdsworth, Enough said about that. The Bender twins, however, appear to be the real deal and very capable of playing at the very highest level. Arsenal could surely not do much better then to sign one of the brothers. whether its Lars or Sven, it's clear either would make Wenger's team a stronger unit and move them a step closer to that title challenge. So time will tell if Arsenal sign a Bender twin or continue to be linked with them forever.